Need help filing your federal and state income taxes? More than a dozen online services are vying for your business, promising to keep your refunds high and time investment low. While you may still see stacks of tax software at big-box and office supply stores, most people who use computers to do their taxes are doing it on the web these days. The user interfaces are basically identical to their software counterparts, and ease of access from computer (and most tablet) browsers has trumped security worries for new and younger users. A growing number of vendors also provide mobile apps with built-in optical character recognition capability that can capture data from W-2 and other forms photographed with your smartphone camera. All of the online services should get the job done, in some cases free of charge. But as usual, you’ll pay more for services that cater to complicated tax situations, provide more guidance and help, and automate at least some data entry. Some services also offer extra inducements, such as TurboTax’s splashy offer to convert some or all of any refund money to Amazon gift cards with 5 or 10 percent bonuses. Here’s a quick look at what’s out there for different types of filers. The IRS’s FreeFile program, intended to encourage e-filing by low-income and entry-level taxpayers, makes commercial software from 14 participating vendors available free of charge to people with adjusted gross income of $58,000 or less. Vendors have divvied up this lower-income pool by setting additional eligibility criteria such as state of residence, age, military service, and so on. You could check out the eligibility criteria for each service yourself, or you can save some time by filling out the FreeFile wizard questionnaire, which returns a list of ready and willing vendors. Either way, be sure to click through to the vendor from the FreeFile website, since it gets you to a start page that usually isn’t available by simply navigating to a service on your own. 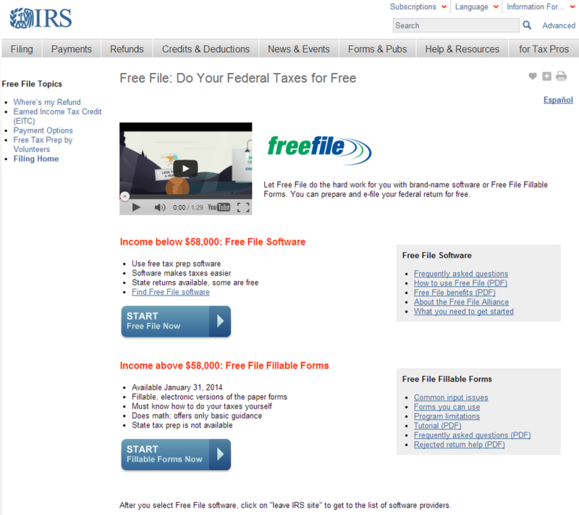 FreeFile makes commercial software avilable free to low-income filers. Even if you don’t qualify for the FreeFile program, the IRS provides a full range of online forms for taxpayers willing to go it alone, using only the IRS manuals and instructions people used to get on paper at the post office. You can fill out these forms and e-file them on the IRS site completely free of charge. That’s not to say, however, that you can get free service only through the IRS. As you probably have surmised from the many ads at this time of year, several tax-prep services offer free returns and e-filing independent of the FreeFile program. Intuit’s TurboTax, for example, sets no income limit on its free federal return so long as your tax situation is simple enough—no Schedule A deductions such as mortgage interest, for instance. H&R Block and TaxAct, the other two major players in this market, and many of the smaller services also offer free federal filing for people with straightforward returns involving W-2 income and few or no deductions. But even if you do qualify for free Federal filing through the IRS or a commercial vendor, be sure to check out the companion state offering (assuming you live in a state that taxes income). State returns are rarely free and in many cases actually cost more than the companion paid federal service. But if you opt to do your state tax return yourself, you might be unpleasantly surprised at how much of a hassle it is to fill out the forms using the info on the free federal return. Tax services make a lot of their money by charging for the convenience of handling your state return, which typically adds only a few minutes to the tax-prep process. If your tax situation doesn’t qualify you for a free service and you don’t want to fill out federal forms yourself, a range of paid services are available. In general, if you’re not a first-time filer, you’ll find sticking with the vendor you used last year is easier than switching, because most can import data from last year’s return. 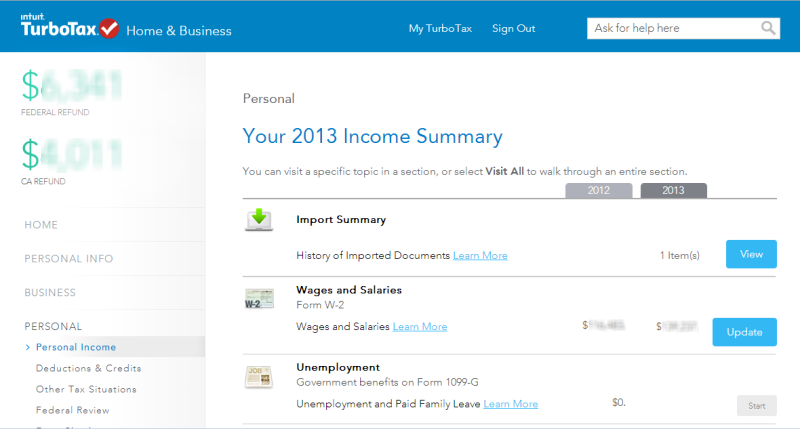 TurboTax's redesign shows you at a glance how this year's figures are stacking up against last year's. TurboTax alone has four different paid service tiers, ranging in price from $19.99 to $49.99. State add-ons cost $36.99 apiece. It’s actually no longer the most expensive service, because H&R Block’s comparable high-end offering costs the same. But TurboTax is also generally the slickest of them all, with extras such as a great community forum, free access to tax pros if you have a question, and the best data import support (for W-2 and 1099 forms). The latter can really save time and improve accuracy if TurboTax supports your financial institutions or payroll service: Simply enter a few data points to verify your identity, and TurboTax quickly populates the appropriate forms with data downloaded from your W-2's or 1099's. TurboTax this year has updated its user interface and helps speed returning customers through its interview-style process by winnowing down the questionnaire up-front (you check off items that don’t apply). TurboTax’s Amazon gift card refund program may appeal to people who frequently patronize the Web retail giant. If you’ve got a refund due, you can opt to receive it (in denominations of $100) on an Amazon gift card. Intuit will add an additional 5 percent (for free or Basic Edition filers) or 10 percent (for Deluxe, Premier, and Home & Business customers) of the refund amount to the card. So, for example, if you opt to channel $500 of a refund into a gift card, you’ll get a card for $525 (if you file using the free or Basic edition) or $550 (all other editions). The offer is good up to a maximum of $2000 per card and $10,000 per customer. You must have purchased the software directly from Intuit or Amazon. 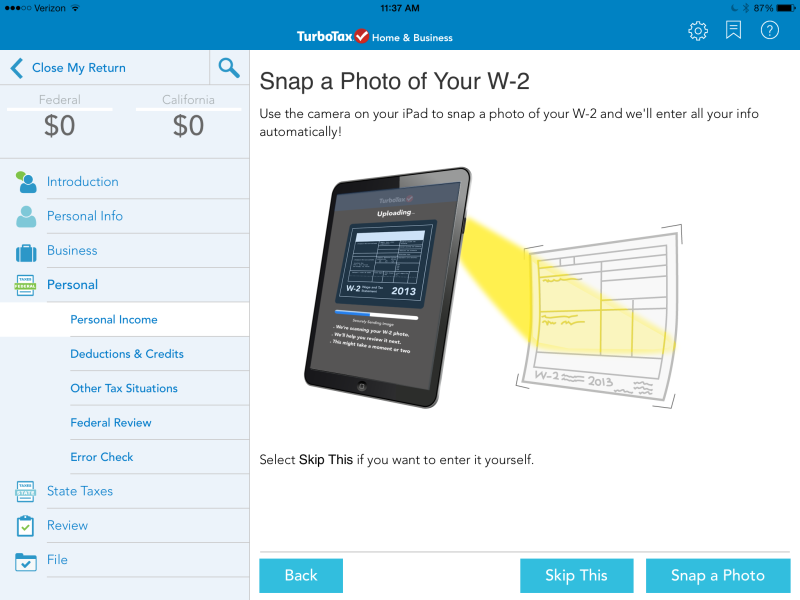 TurboTax for iPad has built-in optical character recognition software that lets you capture W-2 data by photographing the paper document. On the mobile side, TurboTax’s iPad app matches its Deluxe edition (or higher, as an optional upgrade) and offers the option of photographing W-2s that you can’t import from payroll services. Also, for the first time, TurboTax’s smartphone app, SnapTax, is available in Spanish. SnapTax offers free federal filing for people who only have W-2, interest, or unemployment income and don’t claim home mortgage deductions. State returns cost $14.99. 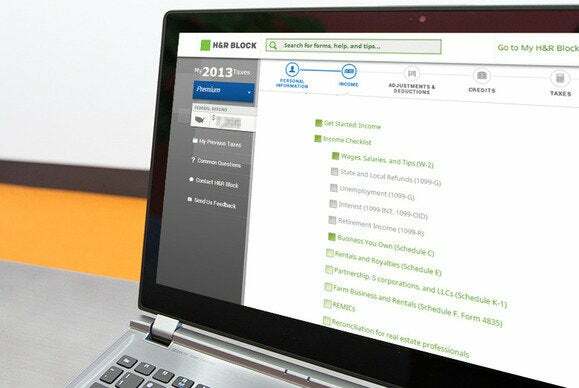 H&R Block has also updated its user interface and is now as handsome-looking as any competitor—although its navigation system still limits your ability to jump ahead to a topic before completing the ones that precede it. Its price structure is somewhat simpler than Intuit’s, with three paid editions ($19.99 Basic, $29.99 Deluxe for investors or homeowners; and $49.99 Premium for business or rental property owners). States add-ons also cost $36.99. 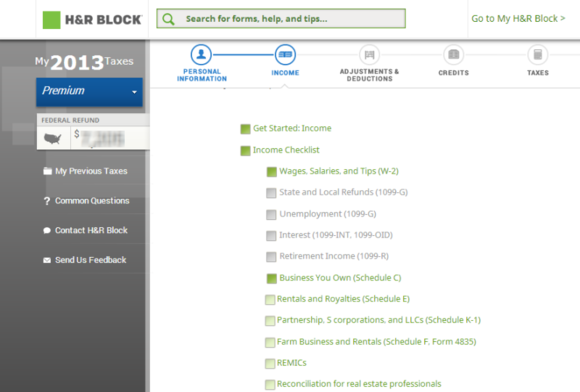 Block continues to leverage its huge brick-and-mortar tax prep network by providing unlimited access to its tax pros for questions, plus audit support should the need arise (meaning a Block tax preparer will help you prepare for and accompany you to any IRS encounters). Block also offers the so-called “Best of Both” option, which charges you extra ($79 for the federal return) to have one of its tax preparers go over your completed return before filing. H&R Block's software makes it difficult to jump ahead by skipping topics you haven't yet addressed. Block’s paid options include pretty good data import support, but in my tests the software required some odd changes to an imported W-2, involving deleting the California state disability insurance entry from its usual location and putting it into boxes labeled for other uses. Other imports went smoothly, however. Block’s mobile apps serve entry-level (1040EZ) filers only, but tablet users can simply access Web-based returns in a desktop-level browser. TaxAct continues to shine as a budget offering—its state-federal combo including all e-filing is a steal at $17.95—with enough help to set it apart from competitors. It touts its accessibility via browser or tablet app (or both) and a pretty decent library of text and video help on a wide assortment of topics. TaxAct’s interface is pleasing, and I especially applaud its straightforward navigation system. 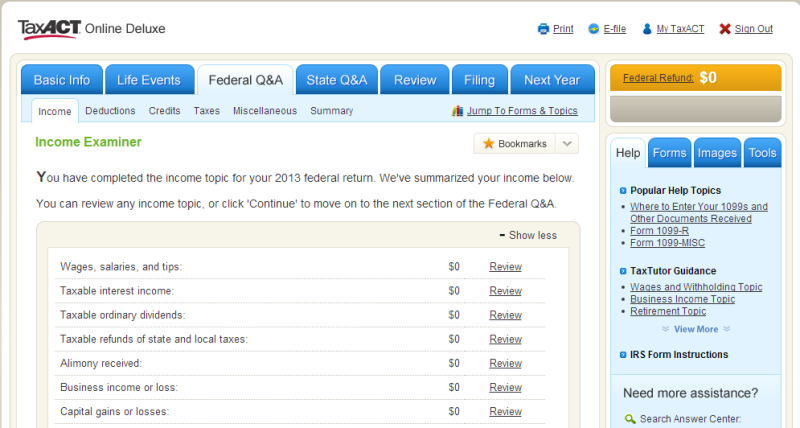 TaxAct's navigation tools let you work on topics in whatever order you choose. What you don’t get at this bargain price is real-time phone or chat access to tax experts (there is, however, email support). TaxAct also has limited ability to import W-2 or 1099 data (although returning users can import their previous year’s data). Still, for budget-sensitive filers who don’t anticipate a lot of questions and work with the handful of financial institutions and payroll services who do support TaxAct, it’s a good deal. The rest of the tax prep services on the IRS’s FreeFile site all offer paid services for people who don’t qualify for FreeFile, but the cheapest services provide little more than glorified forms (which you can fill out for free on the IRS’s site), and the more expensive services don’t really match TurboTax or H&R Block in terms of features. Interface preferences are, of course, highly personal, but the bottom line hasn’t changed much: TurboTax remains the service of choice if you want the most features and options, H&R Block should appeal to people who want a bit of in-person interaction, and TaxAct will deliver a solid product for people who don’t need the bells and whistles of the pricier competitors.